FREE SHIPPING ON EVERY RAZOR.COM ORDER. With one twist of the throttle, blue LEDs light up and an already perfect scooter is magically transformed into something extra. And you’re all about extra. With all the same stuff as the E100 (for ages 8 and up, 10 mph, 40 minutes of uninterrupted awesomeness), the E100 GLOW takes things to a whole next level. Coolest Kid on the BlockOther kids in the neighborhood had other colors from last yr but the kids on the block were really drawn to the glow feature. 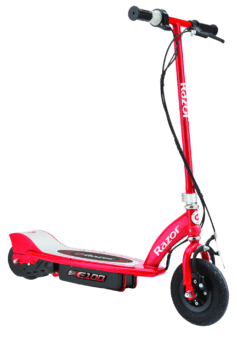 I'm very happy with my purchase and would highly recommend to anyone looking for a Razor scooter with a different flare. Sign up for amazingly cool & exclusive Razor deals, news, and sales. 2019 Razor USA LLC. Use protective gear and check local laws.